The Carnival AirShip is ready to debut in the skies over California beginning tomorrow, January 1, for the Rose Parade. 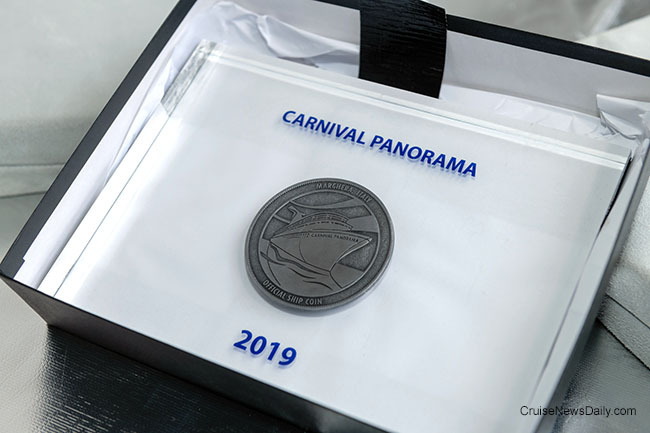 It will remain in California throughout January promoting Carnival Panorama's debut at Long Beach in December 2019. Photos courtesy of Cruise Cruise Line. All rights reserved. May not be copied or used without permission. Carnival had a christening today in Pasadena. Not exactly a new ship, but kind of. 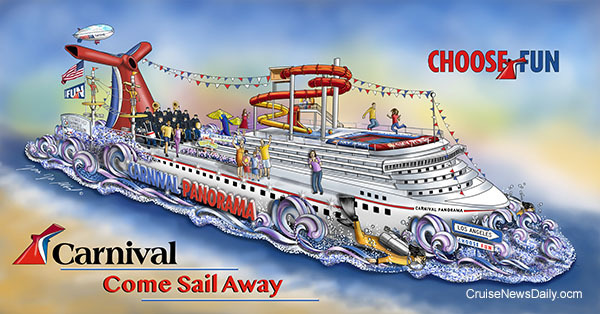 Carnival Cruise Line has been building a replica of Carnival Panorama, in float version, that will “sail” in the Rose Parade in Pasadena on Tuesday. Completion of the construction phase was marked today by its christening when Rose Queen Louise Siskel smashed a confetti-filled bottle across the "bow" of the float, officially naming it "Come Sail Away." Princess' new wine menu has debuted and it's full new and wondrous things thanks to their partnership with Master of Wine and Master Sommelier Doug Frost, who believes it is the best wine list in the cruise industry. He has expanded it by 50 percent to a total of 142 wines all with descriptions that make it easy for an occasional wine drinker to know what he (or she) is ordering. Details appeared in the December 27 issue of Cruise News Daily. A 20-year-old male employee went overboard from Royal Caribbean's Harmony of the Seas in the early morning hours Tuesday (December 25) while it was cruising between Port Everglades and St. Maarten. The man from the UK was an entertainer, and the ship became aware he was missing when he did not report for work as scheduled. The crew performed a shipwide search, and security staff reviewed closed-circuit camera footage. They located footage recorded about 4am where the man was seen entering an area on Deck 5 and then was not seen again. If Carnival were to stack up all the Christmas trees they have on their ships, end to end, do you know how tall they would be? Details appear in the December 27 edition of Cruise News Daily. Before it left on its inaugural cruise of the Canary Islands this weekend, AIDA's new LNG-powered AIDAnova had to gas up (literally). 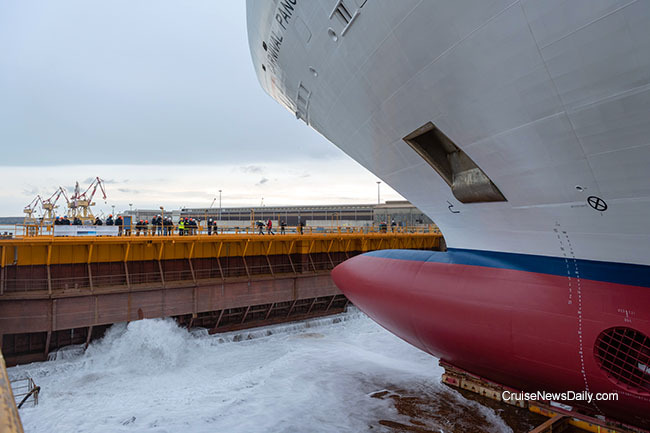 As the first cruise ship that will run on Liquified Natural Gas both at sea and in port, it takes a lot of the gas, and new procedures had to be developed for virtually every step of the operation. That included the bunkering of the fuel (filling up the tanks on the ship). The Otis Redding classic "(Sittin' On) The Dock of the Bay" is the sixth most-played track of the 20th century. It's been streamed more than 200 million times, and it was #1 on the Billboard Hot 100 and R&B Charts. It is also one of the most-requested songs by passengers sailing on Princess Cruises. It's been 50 years (can you believe it?) since the song was written by Redding, and to mark the anniversary, Princess has teamed with the Otis Redding Estate and Playing for Change to produce a new video version of the song recorded in port cities around the world visited by Princess Cruises - San Francisco, Los Angeles, Ft. Lauderdale, Hawaii, Jamaica and Barcelona. The new all-star video features Jack Johnson, Corinne Bailey Rae, Aloe Blacc, Dexter and Otis Redding III, James Gadson, Louis Mhlanga, the students from the Otis Redding Foundation Music Camp, Claire Finley, Irie Love, Mar Sanchez, and the Rass Brass Extension. Cunard is returning to Alaska for a short season in 2019. Response to that program has been so good, the luxury line has decided already that a full season will be in order for 2020. 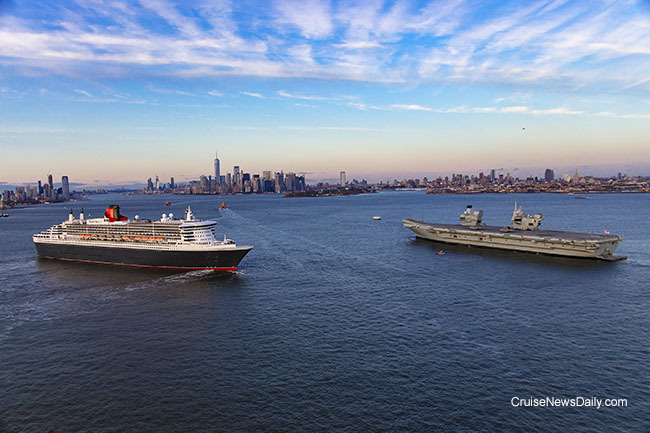 The 2020 program will double the number of 2019 cruises and run from June through September on the newly-refit (this year) Queen Elizabeth sailing round trip from Vancouver. These won't be your standard off-the-shelf week-long cruises. Each is different ranging from nine to twelve nights. Details appeared in the December 20 issue of Cruise News Daily. Photos courtesy of Chantiers de l'Atlantique/Bernard Bigger. All rights reserved. Silver Wind just completed a dry dock with extensive refurbishment. Today, Silversea announced a second part to the project, scheduled for the summer of 2020, that will give the ship ice-class classification and make a number of other major improvements to the ship's interior. When completed in a year and a half, Silver Wind will give the line more flexibility in where it is assigned and allow it to sail both classic and expedition itineraries while giving passengers even more features and luxury. A 22-year-old man with autism apparently went overboard from Carnival Fantasy on Sunday while it was en route from Mobile to Progreso. 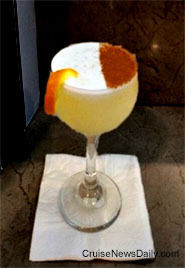 Details appeared in the December 19 issue of Cruise News Daily. No, it's not space, the final frontier. It's San Francisco. It's hard to believe but Carnival Cruise Line has never homeported a ship in the City by the Bay. But that's going to change in 2020. San Francisco will become Carnival Cruise Line's 19th home port in North America when Carnival Miracle operates a series of cruises from there to Alaska, Hawaii and Mexico. The complete story appeared in the December 18 issue of Cruise News Daily. Royal Caribbean International has announced Oasis of the Seas will replace Anthem of the Seas in the New York market (sailing from Cape Liberty in Bayonne) for the summer 2020 season, marking the first time an Oasis-class ship has sailed from the Big Apple. Yes, it will fit under the Verrazano Narrows Bridge thanks to its unusual feature of being able to lower its funnel. The feature was last used on its delivery sailing from the yard in Turku (Finland) as it went under Denmark's Storebaelt Bridge. The complete story appeared in the December 17 edition of Cruise News Daily. Video courtesy of Royal Caribbean International. All rights reserved. May not be copied or used without express permission. Royal Caribbean's return to New Orleans after a three-year-absence. Details appeared in the December 17 issue of Cruise News Daily. Video courtesy of PTZ TV. All rights reserved. May not be copied or used. A roller coast has long been rumored to be a feature we could expect to see on a cruise ship, and Carnival Cruise Line has finally decided to be the first ones to do it. The line said they are adding “the ultimate sea coaster” to the top deck of Carnival Mardi Gras when it debuts in 2020. BOLT will be the place to get your adrenaline rush because it can cruise along 187 feet above the sea, making hairpin turns with twists - and turns - and drops - at speeds up to 40 miles per hour along nearly 800 feet of track. Some will wish it's less, while others will want to ride again. Video courtesy of Carnival Cruise Line. All rights reserved. May not be copied or used without express permission. Video courtesy of the US Coast Guard. All rights reserved. 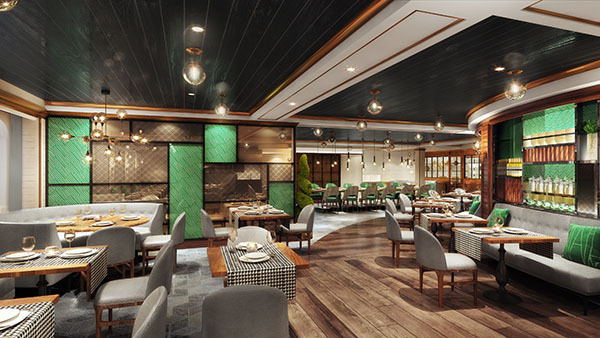 When Holland America's Nieuw Statendam debuted last week, it came with a special restaurant - so special the line even had a ribbon cutting for it. 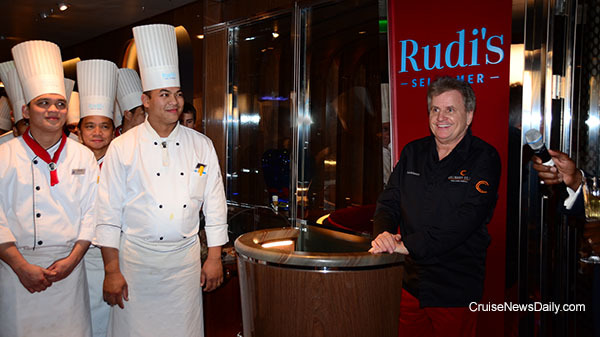 Nieuw Statendam is the first of Holland America's ships to have a dedicated space for Rudi's Sel de Mer. 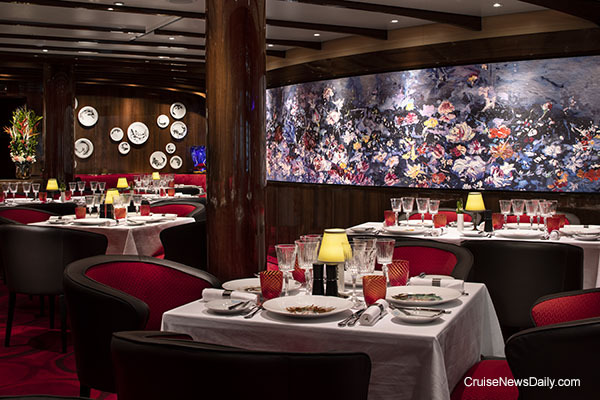 The first Sel de Mer debuted as a pop-up restaurant when Koningsdam debuted in 2016. 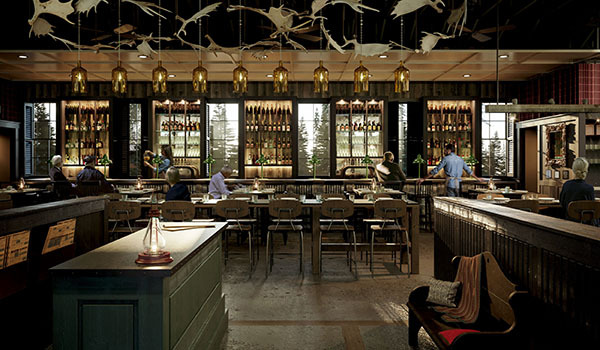 It was such a runaway hit with passengers, Holland America decided to create pop-ups of the premium restaurant fleetwide. The complete story appeared in the December 13 issue of Cruise News Daily. Photos courtesy of Holland America Line. All rights reserved. May not be copied or used without express permission. After a delay which canceled its first scheduled sailing, Meyer Werft delivered AIDAnova at Bremerhaven today. At 183,900 gross tons, it's AIDA's largest ship, and the largest Meyer has ever built, but what's more important about it is that it is the world's first LNG-powered (Liquified Natural Gas) ship that can operate on the clean-burning fuel both at sea and in port. Photos courtesy of AIDA and Meyer Werft. All rights reserved. May not be copied or used without express permission. Canyon Ranch is Cunard's spa operator, and Canyon Ranch has always had a quite different approach to spas than what you find on most ships. 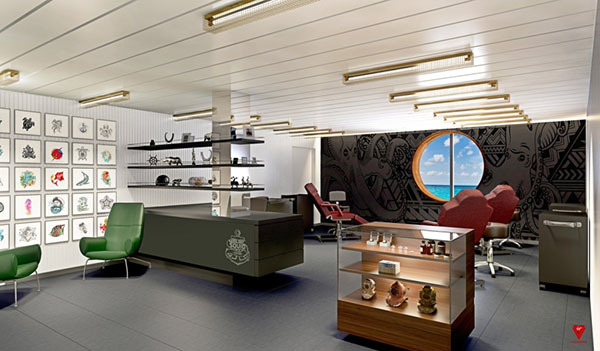 Cunard has partnered with Canyon Ranch to develop the Mareel Wellness & Beauty concept which Canyon Ranch will be rolling out slowly across the Cunard fleet. The complete story appeared in the December 11 issue of Cruise News Daily. Until this week MSC Armonia was homeported in Havana for European passengers, but MSC Armonia arrived in her new home port of Miami today, where she will be one of three MSC ships homeported there this winter, two of which (including MSC Armonia) will remain year round. But she won't be any stranger to Havana. She will be a weekly visitor to Havana on her weekly western Caribbean itinerary where she will spend two full days (Saturday and Sunday) giving passengers plenty of time to explore this port of call new to US citizens. California, Get Your Cameras Ready, and Look Up! The Carnival Airship, famous in the Southeast after tying up traffic as it flew over major cities earlier this year, is going to California in January to promote the impending arrival of Carnival Panorama on the West Coast. 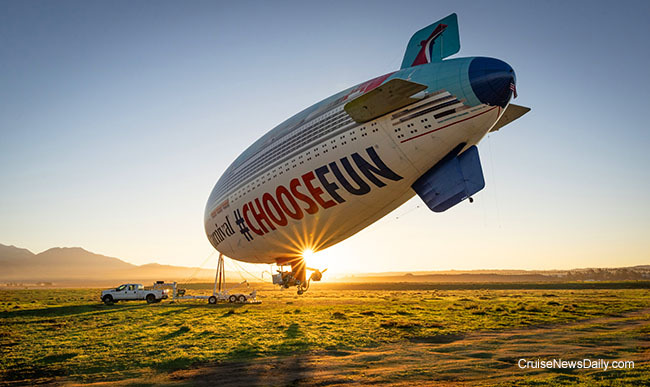 Like its swing through the Southeast, Californians who look up and snap a photo of the Carnival Airship, they could win prizes, including a Carnival cruise. Details appeared in the December 10 issue of Cruise News Daily. With many cruise line employees, if they say they are going to get some more training, it could mean they are learning to fold a new towel animal or learn how to make some exotic new drinks, but if you work for Silversea and the Antarctic summer is coming, it could mean something very different. It could mean you will find yourself camping for a few days in the Chilean Andes. 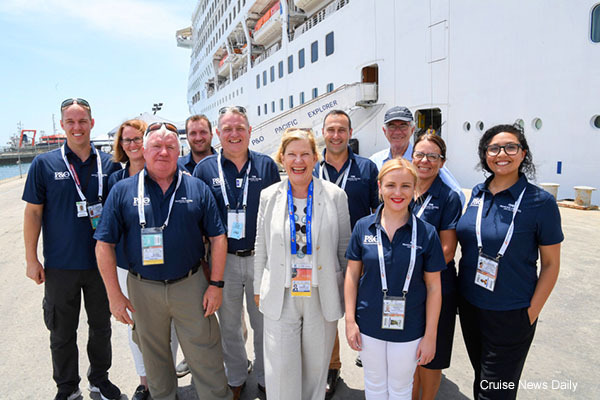 Twelve members of Silversea's Expedition Team did just that to build their existing skillset and further develop their leadership skills in preparation for the line's tenth season of deep travel in Antarctica. 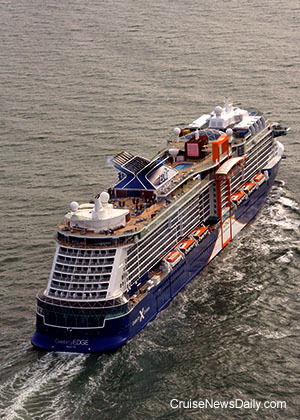 The complete story appeared in the November 30 edition of Cruise News News Daily. Costa expanding their food donation program to Barcelona. Since it's inception, the program has provided more than 70,000 meals to the hungry where the food would have gone to waste. MSC has acquired a significant interest in Trieste's cruise terminal. CLIA will have a new president effective January 1. 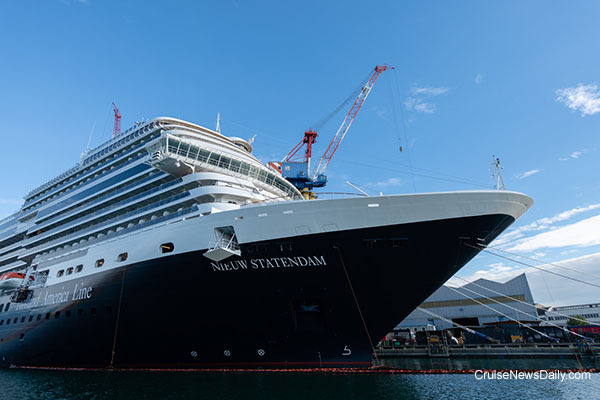 The frenzy of shipyards finishing up ships, handing them over, taking orders and starting construction on others continued today when Fincantieri delivered Nieuw Statendam to Carnival Corp and Holland America at their Marghera yard. 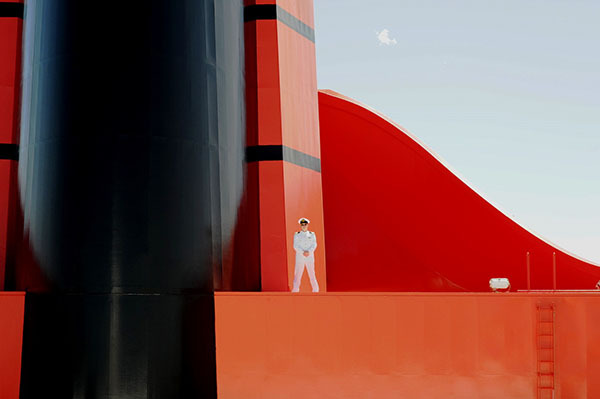 Nieuw Statendam at Fincantieri's Marghera yard. Virgin Voyages had two big announcements for South Florida this week. In deployment news, the line said their first ship, Scarlet Lady, will continue to sail from Miami to the Caribbean throughout 2021. They went on to say that the company's second unnamed ship will also sail from Miami during the 2021/2022 fall and winter season. 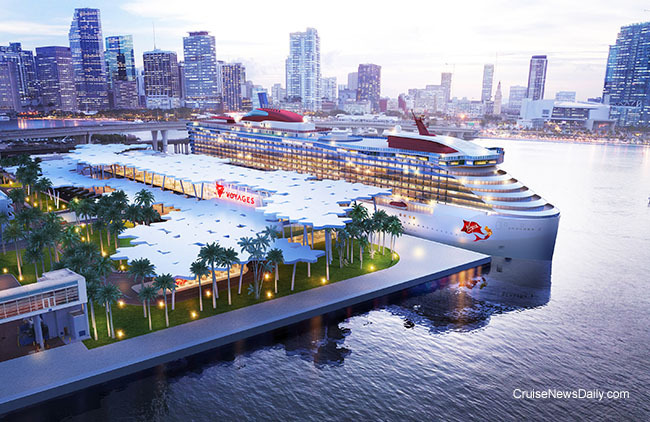 Virgin also announced plans to build a new terminal at Port Miami on its northwest side. Details appeared in the November 29 issue of Cruise News Daily. 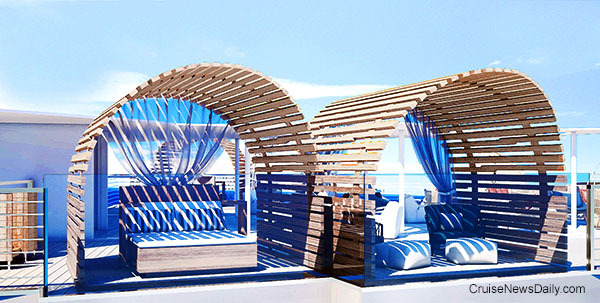 Rendering courtesy of Virgin Voyages. All rights reserved. May not be copied or used without express permission. 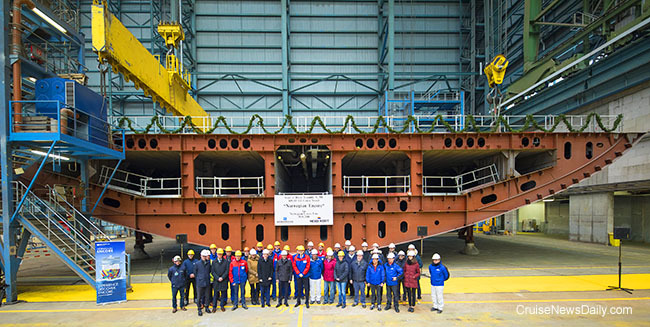 Meyer Werft laid the keel today for Norwegian Encore at their Papenburg yard starting the actual assembly of the 169,145-ton vessel which will debut in November 2019. The first block, which was actually designated as block #3, was lowered into place in Meyer's covered building dock #2. The block is 65 feet long, 132.5 feet wide and weighs 558 tons. Norwegian also used the occasion to announce entertainment and several features which will be on the ship. Norwegian Encore keel laying. Note the festive holiday decorations on the block. Two crew members receiving second-degree burns in an engine room accident aboard Norwegian Escape. Norwegian Jade's propulsion problems continuing as its return to service was delayed by a day. Carnival's next ship, the 133,500-ton Carnival Panorama is set to debut at the end of next year on the West Coast. Kicking off a year of promotion, Carnival announced participation in a quintessential West Coast event, the Rose Parade. The complete story appeared in the November 27 issue of Cruise News Daily. Rendering courtesy of Carnival Cruise Line. All rights reserved. May not be copied or used without express permission. It's less than 100 days until MSC Bellissima debuts and is named in Southampton on March 2, and MSC is ready to begin filling us in on its features. At 171,598-gross tons, and carrying 4,434 passengers in double occupancy (5,686 total), MSC Bellissima will be the largest ship ever to be named at Southampton. It is the second in the Meraviglia class to be delivered by Chantiers, and like most every ship today, extremely technologically advanced to be extremely energy-efficient and environmentally friendly. Fincantieri cut the first steel today at their Monfalcone yard for the first 169,400-ton Seaside EVO (evolution) ship which MSC revealed will be named MSC Seashore. 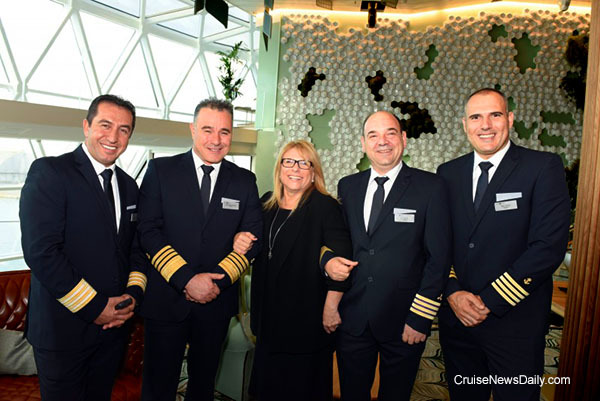 The complete story appeared in the November 26 edition of Cruise News Daily. Rendering courtesy of MSC Cruises. All rights reserved. May not be copied or used without express permission. The show takes place right on your tabletop between courses thanks to a partnership with TableMation Studios. It's like nothing you've ever seen before at sea. This story appeared in the November 26 issue of Cruise News Daily. A 27-year-old man who was a British crew member aboard Royal Caribbean's Adventure of the Seas was discovered missing after the ship had arrived in Cozumel last Thursday (November 22) and he did not show up for his shift. Details appeared in the November 26 edition of Cruise News Daily. Seven crew members from MSC Seaside will be in federal court next week to be arraigned on smuggling charges connected to smuggling cocaine into the US. They were arrested in a November 17 sweep of the ship by Customs and Border Protection dogs (arf!) in which agents found 17 pounds of cocaine on their bodies or in their cabins. The complete story appeared in the November 26 issue of Cruise News Daily. Virgin Voyages gave us another peek into the Virgin world yesterday when they revealed the dining experiences they will have aboard Scarlet Lady when she debuts in 2020. 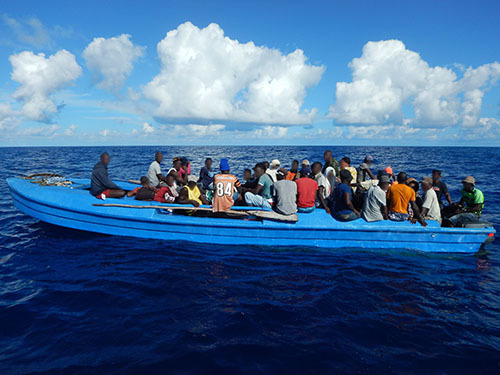 They want them to be very different from anything else at sea, and they seem to be meeting that goal. Royal Caribbean's Symphony of the Seas arrived at her new home - the brand-new Terminal A in Miami - in the pre-dawn hours of Friday morning. When the world's largest cruise ship moves in, it's a visual event as you can see in the video. Please note that the video below is b-roll so there is no sound, but it does give you an opportunity to view the ship from a number of angles. Whoever first put the words “Glamourous” and “Camping” together never even envisioned this. But you can now spend the night, camping in luxury, under the stars on a ship in the Galapagos Islands. When Celebrity's ship, custom-designed for Galapagos cruising, Celebrity Flora, debuts, you will be able to camp out in luxury under the stars (complete with a naturalist to point out the constellations) with an elaborate dinner served to you, an extra-comfy bed and even breakfast brought to your bed the next morning - all in those plush cabanas near the pool you can rent in the daytime to comfortably relax and nosh in. Daytime view of where you will glamp and night. Rendering courtesy of Celebrity Cruises. All rights reserved. May not be copied or used without express permission. You used to be able to set your watch (or calendar) by it. In the spring they'd leave for Europe, and in the fall, they'd come back. But lately, a big, white Princess ship would stick around the Caribbean in the summer. Princess announced this week that again during the summer of 2020, they would be leaving Caribbean Princess behind in the Caribbean, the only ship currently with the Ocean Medallion program fully implemented. Details appeared in the November 8 issue of Cruise News Daily. Royal Caribbean International is setting up to have their biggest summer ever in Alaska in 2020 when they have three ships there, including the return of Ovation of the Seas (after debuting in Alaska in the summer of 2019). In addition to Ovation, joining it will be Radiance of the Seas and her sister, Serenade of the Seas. 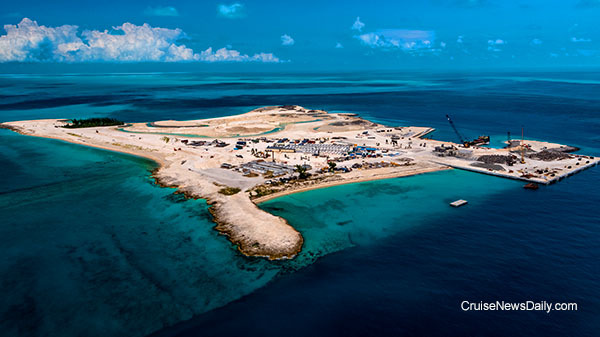 Work is entering the final phase on MSC's private Bahamian island, Ocean Cay, with the planting of the first trees. That doesn't mean the facilities are almost complete and the island is near opening. There's still a lot of work to do before the first ship arrives next November. Ocean Cay as it appears today. It will open in just a year. The contract creating CSSC Carnival Cruise Shipping Ltd has been finalized between China State Shipbuild Corp (CSSC) and Carnival Corp. The joint venture was first announced in 2015. The purpose of the new company is to launch the first multi-ship cruise brand specifically designed to serve the Chinese cruise market. The new company will be launched with two ships that will be built in China and two ships purchased from Carnival's Costa Group. 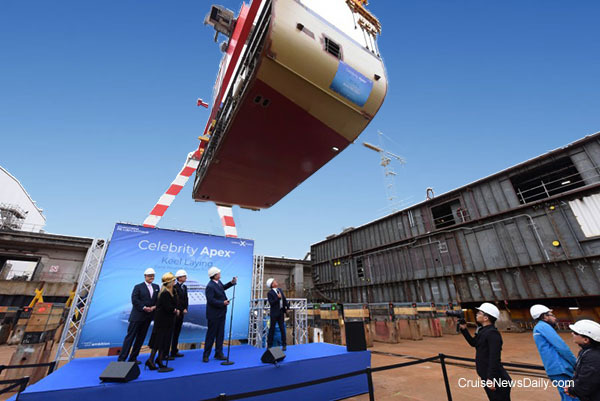 The complete story appeared in the November 6 issue of Cruise News Daily. 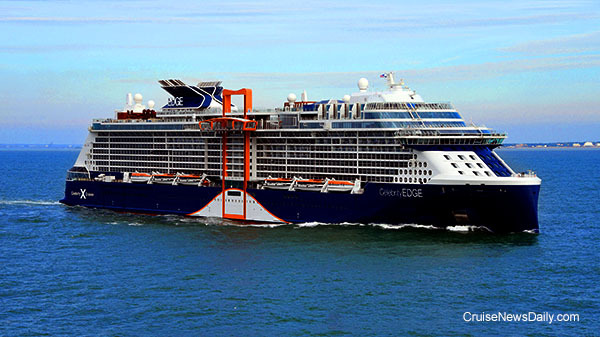 Celebrity Cruises reports that Celebrity Edge left the Chantiers yard at Saint-Nazaire, France on Sunday en route to her new home port at Terminal 25 at Port Everglades, near Ft. Lauderdale. The new ship is expected to arrive on Monday, November 19. Enchanted Princess will be the fifth of the Royal-class ships, but like her four sisters, her features will be something of an evolution from Sky Princess, and Princess is beginning to detail what those will be. 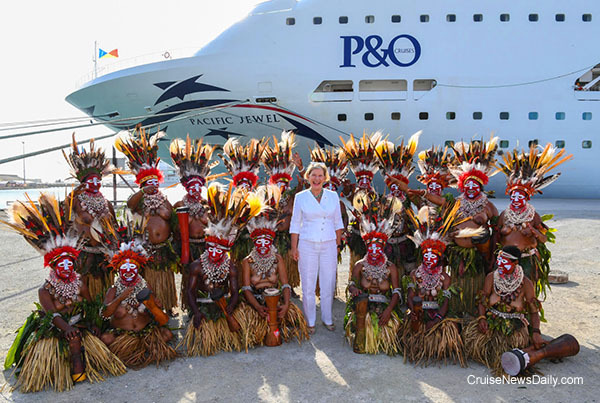 The complete story appeared in the November 5 issue of Cruise News Daily. 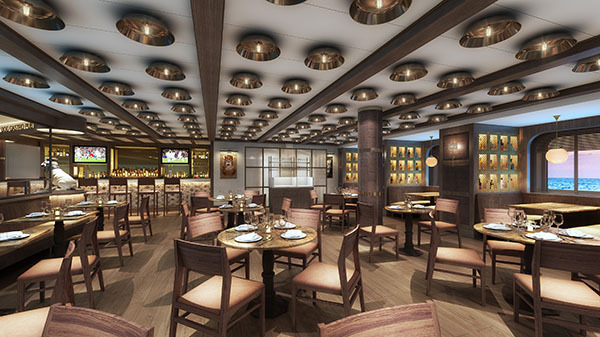 Renderings courtesy of Princess Cruises. All rights reserved. May not be copied or used without express permission. Half of Windstar's fleet - three ships - docked in Barcelona last week (October 27). It's seldom that many ships from the line meet up like that, so Windstar made an occasion of it. The three ships - Star Breeze, Wind Surf and Windstar - represented both types of vessels Windstar has - one power yacht and two sailing yachts. Details appeared in the November 5 edition of Cruise News Daily. 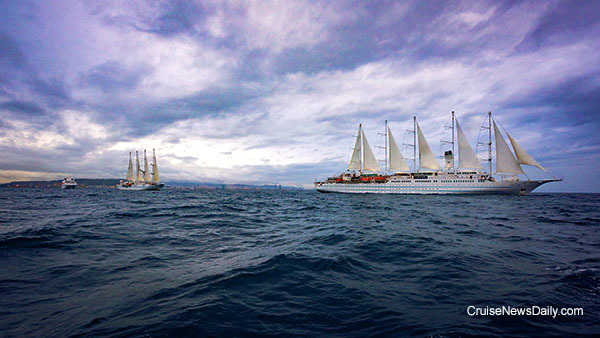 Three Windstar Ships leaving Barcelona, (L to R) Star Breeze, Wind Star and Wind Surf. 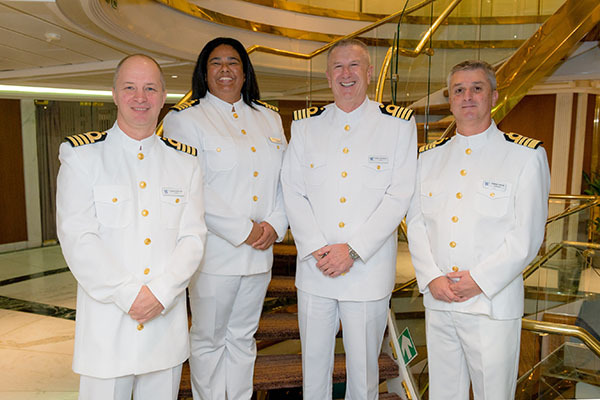 Windstar Captains (L-R): Vitaliy Brylko (Star Breeze), Belinda Bennett (Wind Star), Roman Krstanovic (Star Breeze), and Pedro Pinto (Wind Surf). 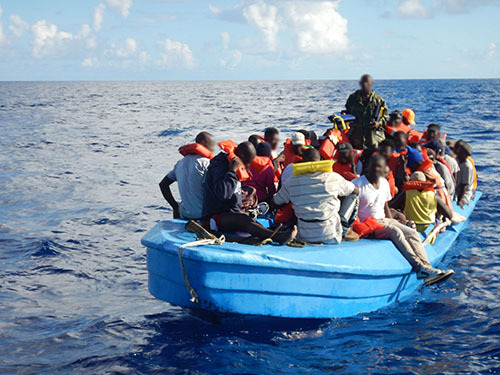 Crew members from all three ships met aboard Star Breeze. Photos courtesy of Windstar Cruises. All rights reserved. May not be copied or used without express permission. Silversea Cruises has received approval to operate 17 cruises to Cuba in 2019 and 2020. Four will sail already this winter in the early months of 2019. Typical of Silversea, they will be a bit longer than a standard Caribbean itinerary and a bit unusual. When Emerald Princess sailed from Canada Place this afternoon at 4:30pm, it wrapped up Vancouver's 2018 cruise season, one the port sees as very successful. Details appeared in the October 19 issue of Cruise News Daily. MSC Cruises surprised the industry by surprise this morning by announcing they had signed an MOA with Italian builder Fincantieri to build four 64,000-ton ships with which to enter the ultra-luxury end of the cruise market. The first will be delivered in the spring of 2023 with one every year thereafter. The complete story appeared in the October 18 issue of Cruise News Daily. Virgin Voyages promised to be different. So far, things haven't seemed that different. True, they don't call their passengers, passengers. They're sailors. But now this. You will be able to come home from your Virgin Voyage with a permanent reminder of the trip. You can come home from Scarlet Lady with not only the souvenir drink glass, but also a tattoo from Squid Ink, the partnership of Virgin and one of New York's iconic tattoo brands, World Famous Tattoo Ink. MSC is going to enter the "extra-luxury" segment of the cruise market with four 64,000-ton ships ordered from Fincantieri today. The ships will each have 500 staterooms. The first ship of the 2 billion euro order is scheduled to be delivered in the spring of 2023. Further details will be in today's edition of Cruise News Daily. With Symphony of the Seas' arrival at her Miami homeport in just a few short weeks, musical students in South Florida are going benefit. To celebrate the naming of the ship in Miami, and it's connection with music, Royal Caribbean is giving grants, through the Grammy Museum Signature Schools Program, to twenty Miami-Dade County Public High Schools. The Grammy Museum is the official foundation of the Recording Academy to fund underserved schools. The 20 schools were selected for maintaining thriving music programs with only limited resources. But Royal Caribbean is providing more than funding. 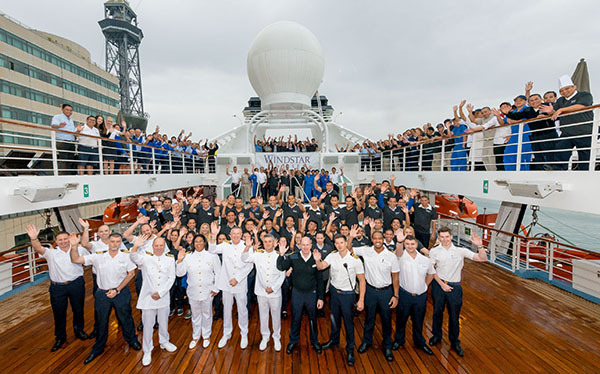 In the cruise line's hometown, Royal Caribbean is providing a unique opportunity for aspiring performers to take their education beyond the school building and have a possibly career-building experience. Last night (October 16) a crew member from Celebrity Reflection was reported missing, and after reviewing video, the line believes he went overboard. At the time the man went overboard off the Greek coast, the ship was sailing between Mykonos and Rhodes. Details appeared in the October 17 issue of Cruise News Daily. Carnival Cruise Line said today that Carnival Victory will undergo an extensive renovation in 2020 that will upgrade the ship so much that when it emerges, it deserves a new name. In 2020 Carnival Victory will become Carnival Radiance. They also said that will complete the program started in 2011 to equalize the features on the ships so Carnival will offer the same experience to passengers across the fleet. 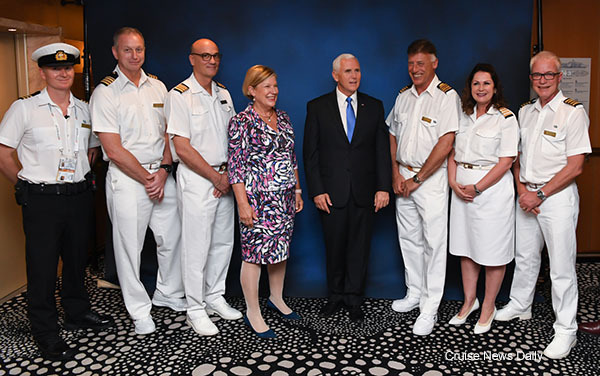 Windstar Captain Belinda Bennett was awarded the 2018 Merchant Navy Medal for Meritorious Service, the 19th person to receive the award and the second at Windstar. 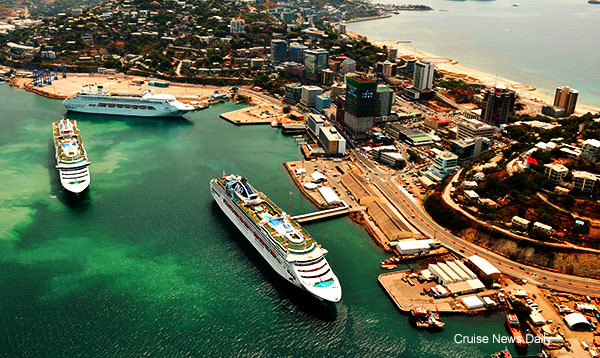 Three Carnival Corp ships have been chartered to house delegates to the APEC Sumit in Port Moresby in November. Details appeared in the October 16 issue of Cruise News Daily. Noted hospitality-designer Adam Tihany has been appointed Creative Director of Cunard's next new ship which will join the fleet in 2022 and will oversee the entire interior design process. 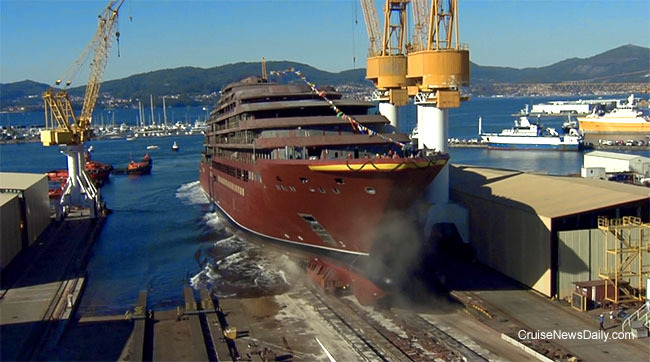 The complete story appeared in the October 15 edition of Cruise News Daily. The Synergy Group has launched a new 24/7 counseling service in seven languages for maritime personal called iCALL. It is available via phone, email and the chat-based nULTA app. The goal is to reduce seafarer suicides and boost mental wellness at sea. Details appear in the October 15 issue of Cruise News Daily. Royal Caribbean's newest project will be in Kansas - far the ocean. Actually, passengers will never go there, but the world will benefit from it. Royal Caribbean is going to be farming - wind farming, and over the next year or two, 62 huge wind turbines are going to sprout in the Kansas plains, financed by Royal Caribbean, and start spinning. The complete story appeared in the October 1 issue of Cruise News Daily. 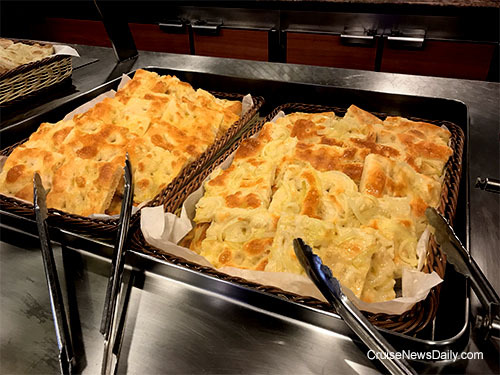 Food Network star Guy Fieri recently took his family on a cruise aboard Carnival Horizon. The video below shows the fun they had. It's only 60 days until MSC's new Caribbean program aboard MSC Armonia launches on December 10. The itinerary is going to be a great new seven-night western Caribbean program that includes calls at Montego Bay, Grand Cayman, Cozumel and Havana. The big pluses that give MSC a competitive edge as far as itinerary are that it is a weekly program and it features a day-and-a-half call at Havana from noontime on Saturday to late afternoon on Sunday. MSC Armonia will sail with new features including a new 35-seat premium restaurant ($35), “Surf & Turf,” a new Havana-inspired Mojito Bar, a new pub menu (sandwiches) in the White Lion Pub along with additional beer selections, and MSC's famed gelato (made onboard in dozens of flavors) is now complimentary. 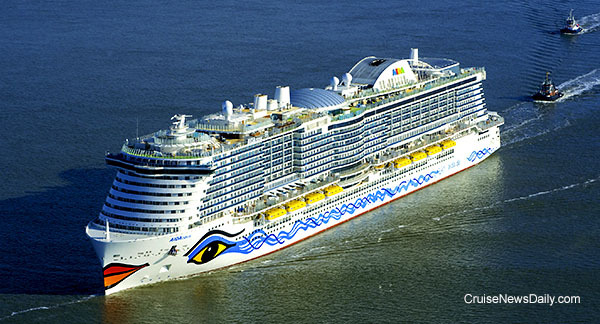 Details appeared in the October 11 edition of Cruise News Daily. A 22-year-old New York man was arrested at the end of his September cruise and has now been indicted on one count of attempting to strangle and suffocate the woman he was dating and with whom he went on the cruise. During the last night of the cruise, she allegedly told him she wanted to end the relationship. A violent attack then allegedly ensued in which he dragged her screaming through several parts of the ship and back to their stateroom. The first of the Ritz-Carlton Yacht Collection's fleet is floating at the Hijos De J. Barreras Shipyard in Vigo (Spain) today. The first unnamed ship was launched yesterday. Because of its small size (24,000 tons, 298 passengers), it was built on land and then slid down rails into the water after a traditional blessing. Photos courtesy of HJ Barreras Shipyard. All rights reserved. May not be copied or used without express permission. Things are getting back to normal in the western Caribbean, but Hurricane Michael is now sweeping across the US Southeast. It has now caused a tropical storm warning to go up at Charleston where Carnival Ecstasy is scheduled to turn around on Thursday. The complete story appeared in the October 10 issue of Cruise News Daily. 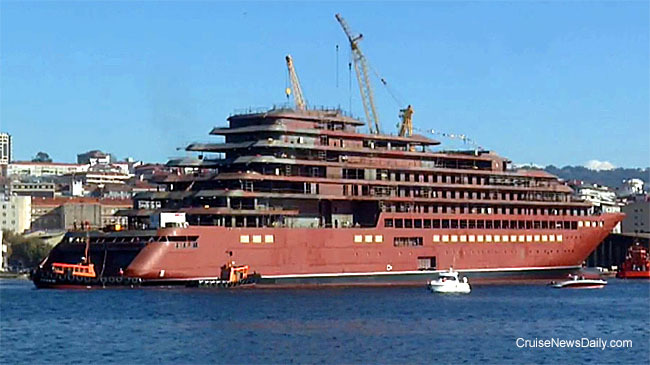 The Netherlands' De Hoop began construction already on Silversea's Silver Origin expedition vessel for the Galapagos. The yard said they cut the first steel on Monday for what the yard will refer to as hull number 489. Delivery is set for March 2020. Would You Like a Little Something to Eat? Carnival is testing small gourmet snacks at the Alchemy Bar aboard Carnival Horizon and Carnival Vista. Details appear in the October 10 edition of Cruise News Daily. The main story today is again the ships that are being diverted due to Hurricane Michael. Since the storm popped up so suddenly and was moving so quickly, it didn't look like it was going cause much of a headache for the cruise industry, but it didn't move north quite as quickly as expected, and apparently, ships that were expecting to slide behind it had to hang back a little more and that's caused some more itinerary changes. The complete story appeared in the October 9 edition of Cruise News Daily. AIDAnova has completed its journey down the Ems River and is ready for sea trials. Details appeared in the October 9 issue of Cruise News Daily. Royal Caribbean Cruises Ltd, has ordered three new ships for their Silversea brand. The company signed an MOU for two of a new Evolution class were ordered from Meyer Werft, the first of which will be delivered in 2022. They also signed a contract with De Hoop for a 100-passenger ship that will sail in the Galapagos. It will be delivered in March 2020. The complete story appeared in the October 8 edition of Cruise News Daily. AIDAnova's 7am departure from the Meyer yard in Papenburg was delayed today due to lack of water in the river. The yard waited for the next tide, about twelve hours later, and they were rewarded with deeper water, and the ship slowly backed out of the yard and through the barrier into the river. We have a photo of the ship leaving the dock below, but by the time it was passing the barrier, it was dark already. It made relatively good time overnight and by 6:30am (still in darkness), it was at Leer. Details appeared in the October 8 issue of Cruise News Daily. AIDAnova leaving Meyer Werft Monday. Hurricane Michael is forecast to move quickly through the western Caribbean this week. It is currently between Cozumel and Cuba and will make landfall in the Florida panhandle on Wednesday. So far only Carnival and Norwegian have had to move ships to keep them safely away from the storm. The storm has moved so fast, that in most cases, it's just a matter of canceling a call or reordering a couple of ports, rather than rearranging an entire itinerary. Details appeared in the October 8 edition of Cruise News Daily. Royal Caribbean Cruises Ltd, has ordered three new ships for their Silversea brand. 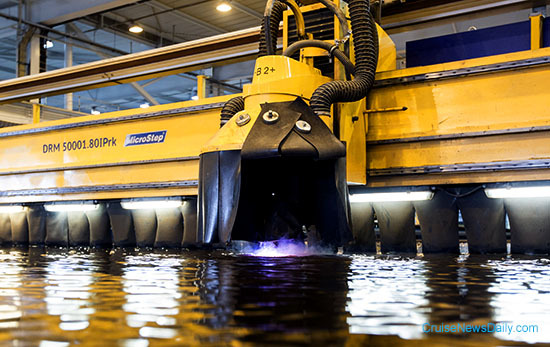 The company signed an MOU for two of a new Evolution class that were ordered from Meyer Werft, the first of which will be delivered in 2022. 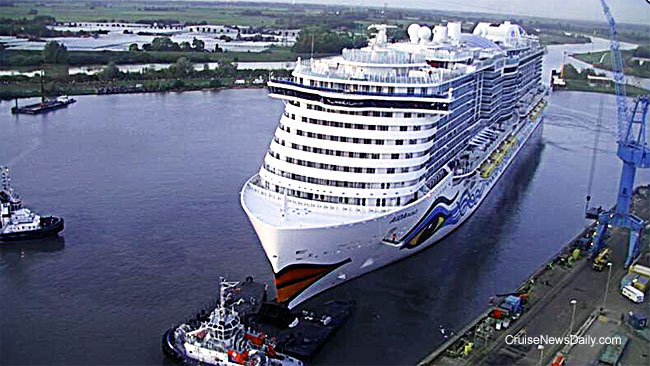 Meyer Werft plans to send the 183,900-ton AIDAnova off down Ems River early Monday morning. The plan is for the ship to begin maneuvering to leave at 7am in the Meyer lagoon and pass the barrier into the river at 8am. Most of us cannot begin to imagine being able to tell someone to write a $5 million check for us to give away, but thankfully people like Micky and Madeleine Arison can and do. The Micky and Madeleine Arison Family Foundation will make an immediate donation of $5 million to Save the Children and Direct Relief to support the urgent relief needs in communities affected by Hurricane Florence in North and South Carolina, Super Typhoon Mangkhut in the Philippines and the recent Indonesia earthquake and resulting tsunami. Details appeared in the October 5 issue of Cruise News Daily.